Leyland cypress (x Cupressocyparis leylandii) is an oval or pyramidal evergreen tree that grows well in United States Department of Agriculture hardiness zones 6 through 10a, according to the University of Georgia Cooperative Extension. This rapid-growing tree can grow up to 3 to 4 feet a year, eventually reaching heights of 50 feet or more. 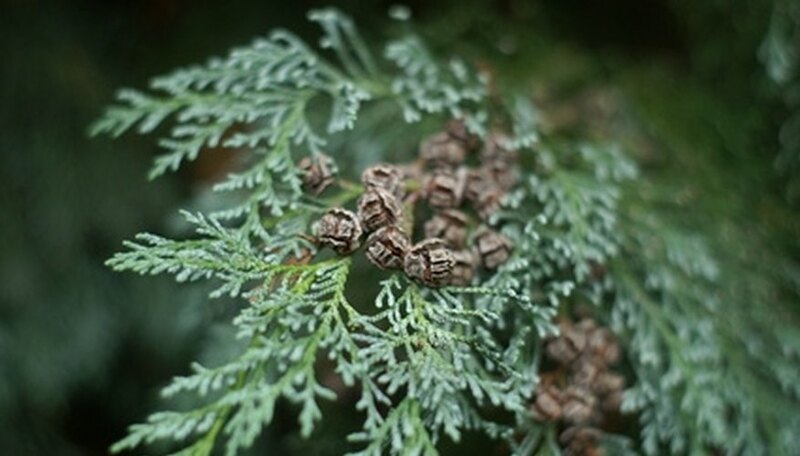 Although Leyland cypress are generally pest free, the tree is susceptible to canker diseases, blight and root rot. Phytophthora root rot, caused by a widespread soil-borne pathogen called Phytophthora cinnamomi, affects the smaller roots of the Leyland cypress. The disease is usually seen in poorly drained soil. Symptons of phytophthora root rot may be yellowing needles and tip dieback. Only a laboratory test can correctly identify the disease. Chemical control is not recommended for trees in home landscapes. Cercospora needle blight is caused by the fungus Cercosporidium sequoiae. Symptoms of the disease are browning of the needles in the lower crown next to the stem. The disease spreads upward and outward until only the needles at the tips of the upper branches remain. Cercospora needle blight can be controlled by using fungicides containing copper. Seiridium canker, caused by the fungus Seiridium unicorne, is probably the most damaging disease of the Leyland cypress. The canker appears as dark brown or purplish patches on the bark and can be accompanied by oozing resin. Branches killed by the fungus turn bright reddish-brown. The fungus can be spread from tree to tree by water splash from rain or irrigation or by infected pruning tools. There is no chemical control for the disease. Infected limbs should be removed and destroyed immediately. Symptoms of Botryosphaeria canker, caused by the fungus Botryosphaeria dothidea, are similar to Seiridium canker. Infected branches turn bright reddish brown but lack resin discharge. Botryosphaeria canker is spread by water splash and infected tools and may be spread by wind. Although there is no effective chemical control, avoiding heavy fertilization and over-pruning and watering frequently during times of drought will allow the tree to be less susceptible.